Marjorie A. Sammons, age 82, of Macomb, passed away at 8:28 A.M. on Wednesday, March 27, 2019 at McDonough District Hospital in Macomb. She was born on June 10, 1936 in Macomb, Illinois the daughter of John and Mildred Brown Ebbert. She married Eddie Sammons on August 31, 1957 in Adair, Illinois. Galesburg, Ill., six grandchildren Kimberly, Jonathan, Erich, Kristen, Jessica, and Joshua, and six great-grandchildren. She was preceded in death by her parents, one daughter Tina Sammons, and one grandson Benjamin Levie. Marjorie had lived all of her life in Macomb. She had worked as a cashier for Woodrums in Macomb, and also as a cashier for food service at Western Illinois University. 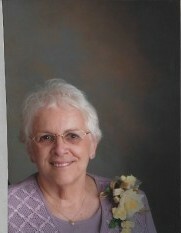 She was also a member of the Wesley United Methodist Church in Macomb. Funeral services will be held on Saturday, March 30, 2019 at 10:30 A.M. at the Clugston – Tibbitts Funeral Home in Macomb. Rev. Dr. Howard White will officiate. The family will meet with friends on Friday, March 29, 2019 from 5:00 P.M. until 7:00 P.M. at the funeral home. Burial will be at the Oakwood Cemetery in Macomb. In lieu of flowers the family requests memorials be made to Linda’s Fund.